Discover Tuscany for the day! While visiting Florence, we had to venture outside of the city to the charming towns of the surrounding Tuscan countryside. Florencetown, a tour company located in Florence provides an enjoyable and stress-free way of traveling to various destinations in Tuscany. We took their tour, VIP Siena and San Gimignano by Night with Dinner, which departs in the afternoon and concludes late in the evening. This tour operates on a daily basis in small groups. As it turned out, we were the only two people taking the excursion that day, so it was a private tour for both Justin and myself. Florencetown takes pride in offering small group and private tours throughout Florence and Tuscany. They promote unique and fun new ways to discover the region, such as Vespa tours, hiking trips, their Inferno tour (exploring places in Dan Brown’s novel), a Florence boat tour, cooking classes, wine tastings, pizza & gelato making classes, and more. Our tour would take us to the Tuscan towns of Siena with a local guide, allow us to have free time in San Gimignano (in the late afternoon when most of the crowds have dissipated), and an elegant dinner at an exclusive location in the countryside. We received a fully guided tour throughout Siena from a local who had lived in the town for her entire life. It was really fascinating to learn about Siena’s rich history and her wealth of stories steeped in tradition. It was also wonderful to listen to the perspectives of a local citizen who could interject some of her own personal tales. The historic centre of Siena has been declared a UNESCO World Heritage Site as an exceptional medieval city with a preserved Gothic appearance from the 12th to 15th century. Our guide walked around Siena with us for around two hours, showing us all of the best spots in town. We were able to ask her any questions as we thought of them. Justin and I thoroughly enjoyed being guided by a local. We would have never learned as much as we did if we had merely walked around by ourselves. It was a truly enriching experience. Siena was founded in the time of the Etruscans, and the first documentation mentioning the town dates back to 70 AD. Nowadays, Siena is a smaller Tuscan town, though it used to be a major city centre in the region. It was located along a major trade route and thrived as a prosperous trading post. The Republic of Siena was an incredible wealthy and highly populated state throughout the Middle Ages. Unfortunately, the Black Death of 1348 ravaged the city, killing many of its citizens. The Republic of Siena existed for over 400 years until it was defeated by Florence in the Italian War of 1551-1559. The first place we visited was the Basilica of San Domenico, also known as Basilica Cateriniana. This church is one of the most important ones in Siena as it is devoted to St. Catherine of Siena. It was first constructed in 1226-1265 and was enlarged in the 14th century. Over the years, parts of the church have been destroyed by fire, military occupation, and even an earthquake. Unfortunately, I was not allowed to take pictures inside of the church, though it was quite magnificent to see. There were several large paintings that paid tribute to St. Catherine, displaying stories from her life and after her death when the Pope made her a Saint. The church contains several relics of St. Catherine. At the Chapel of St. Catherine, there is an altar prominently displaying these relics: her preserved head and thumb. We left the church and began to walk around the town. One of the first important places we stopped at was Piazza Salimbeni. Palazzo Salimbeni is a Gothic urban palace built in 1472, located in Piazza Salimbeni. It was associated with the ancient mercantile family, Salimbeni. It now serves as the headquarters for the Monte dei Paschi di Siena, the major banking corporation in Europe. Siena is divided up into 17 neighborhoods, or contrade. Our tour guide had lived in Siena for her entire life and was born in the Nicchio contrada (Seashell district). Each contrada has its own motto, flag, museum, and fountain. When a baby is born, it is baptized into the contrada which represents that he or she will always belong there. Each contrada has its own festival week. While we were in Siena, the Oca (Goose) contrada was celebrating. There were lights, decorations, and flags out for the Goose neighborhood. Twice a year, the 17 neighborhoods compete in the Palio di Siena. This horse race is held on July 2nd and August 16th of each year. In each race, only 10 neighborhoods compete: the seven which did not compete in the previous year, and three that are chosen by random draw. The Palio event is much more than just a horse race; it represents the competition and historical rivalries between the contrade. This interesting shell-shaped piazza is home to the semi-annual Palio races. The jockeys in the race must ride around Piazza del Campo three times, which is covered in a thick layer of dirt. The event usually lasts about 90 seconds in total. Many jockeys are thrown off the horses during the race, and it is common for a horse to finish a race without its jockey. The first horse across the finish line is declared the winner, and that contrada gains all of the glory. The Piazza del Campo also contains the Torre del Mangia, one of the tallest secular towers in medieval Italy. The tower was built to be exactly the same height as the Siena Cathedral to demonstrate that the church and state were equal in power. The Siena Cathedral is a very impressive structure with ornate detail carved in marble throughout the facade. It was designed and built between 1215 and 1263. The population of Siena in the Middle Ages exceeded 50,000 people and the construction of a massive addition began in 1339 to accommodate all of the citizens. In 1348, the Black Plague was devastating to Siena and wiped out about 75% of the city’s population. Construction of the addition came to a grinding halt. The work never resumed as the church no longer required the additional space. The outer walls of the extension can still be seen today. An interesting fact that I didn’t realize until our tour guide explained it: you might see some holes in the walls of some buildings. This demonstrates that the buildings were constructed during the Middle Ages as scaffolding was inserted into these spaces in the walls, and they were never filled in afterwards. There are an immense amount of structures throughout Siena with these spaces in the walls, which illustrates the ancient age of the town and how it is incredibly well preserved. Here are some photos from other places in Siena that we explored. A hidden fountain that our guide showed us. A very quiet and peaceful place. After exploring Siena, we met with Giacomo who drove us to the next Tuscan town: San Gimignano. 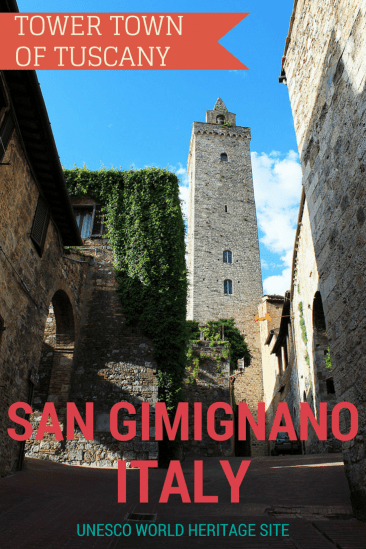 San Gimignano is most known for its preserved towers that line the hillside, numbering a dozen or so, creating a medieval skyline. The historic centre of San Gimignano is a UNESCO World Heritage Site. We arrived in San Gimignano just before 5:00pm, which was perfect timing. Many of the large tour groups had left for the day, and the busy town was left without very many tourists. Florencetown has designed the tour with the crowds of tourists in mind and tries to minimize our exposure to them. We were very grateful for that! Giacomo gave us one hour to explore the town, which was a good amount of time. Though it would have been nice to have been guided around the town by a local, it was also refreshing to have a bit of a break. We were dropped off just outside the city’s wall, left to admire the gorgeous pastoral landscape. We roamed around at our own pace, discovering the beautiful wonders of San Gimignano. The high walls, tall buildings, and narrow streets kept most of the Tuscan town shrouded in shadows, with rays of sunlight gleaming through at every turn. Though we were surrounded by cobblestone roads and rocky walls, vines had reclaimed portions of the buildings and potted plants were carefully placed in doorways and alleyways. We strolled around town, visiting small shops and piazzas, with our necks craned up to admire the tall towers and majestic churches. “See that building up there?” Giacomo pointed towards the side of a huge hill as we drove along. “We will be having dinner at that mansion.” Mansion? 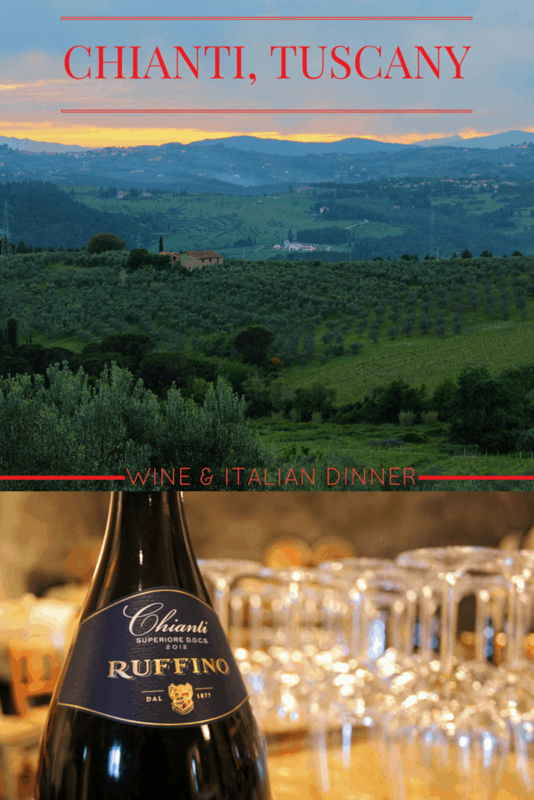 As if I didn’t already feel spoiled enough by the riches of Siena and San Gimignano, we were headed towards an elegant villa nestled in the hilltop of the Chianti region. Florencetown rents space at a huge mansion in the countryside for their cooking classes, wine tastings, and dinners. Before dinner, Giacomo told us all about the surrounding vineyards. This region is the ideal climate for growing grapes for wine and olives for making olive oil. There were vineyards and trees growing as far as I could see. The wine we would be tasting was grown and produced at an estate within steps of the villa, Ruffino Winery. The sun began to set and the sky darkened. There was a separate room for the wine tasting, though we only tasted one wine there. The other wines we enjoyed with our dinner (we tried three different Ruffino red wines in total). The barrel room was decorated purely for show, though I really enjoyed the ambiance. And we really enjoyed the wine! Learn more about wine making in Chianti. It was time for dinner! We really didn’t expect to be this spoiled. The chefs created a huge table full of delightful vegan dishes for us! We mentioned that we were vegan and were told that they could create some salads for us. That sounded good to me. When we walked out to the table, there was dish after dish of delicious Italian meals, and only for the two of us. We were the only two taking this tour, and we had the entire table of food to ourselves. It was incredible. There were all sorts of local delicacies, highlighting the fresh produce of the region. There was toasted bruschetta bread with an assortment of different balsamic vinegars and oils to try. There was a bean salad, a chickpea and rosemary salad, pasta in olive oil with fresh herbs, green beans, corn, carrots, grilled vegetables, an eggplant dish, rice dishes, and so much more. I ate as much as I possibly could, trying a little bit of everything. It was like living inside a dream: talented chefs had prepared fresh and tasty Italian vegan meals for us in a serene and beautiful environment. I even saw a cat through one of the windows! Though the meal for this tour wouldn’t be typically served as a vegan one, it shows that you can definitely make special requests for dietary restrictions or choices. We were so impressed with our dinner. Furthermore, we were so impressed with this tour. What a fabulous day we had enjoying Tuscany! At the end of the tour, GIacomo drove us right up to our apartment and dropped us off there to ensure that we didn’t have to walk home in the dark. We barely scraped the surface of what Tuscany has to offer. Check out even more adventures in Tuscany if you’re seeking more suggestions. We highly recommend Florencetown and this tour, VIP Siena and San Gimignano By Night. 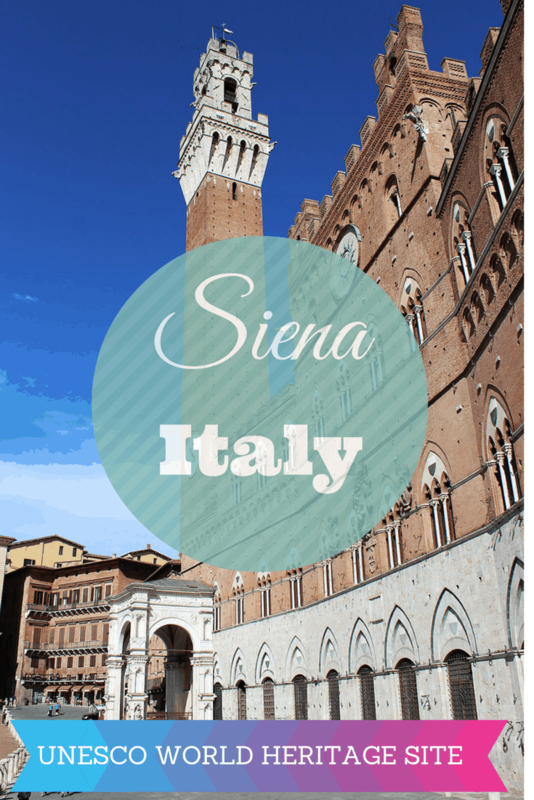 We could have visited Siena and San Gimignano on our own, but we definitely would not have had as amazing an experience as we did on this tour. We were transported from place to place with ease with the help of our driver. In Siena, we were given a thorough history lesson from our knowledgeable guide that was so interesting. Otherwise, I would not have learned about the rich background and heritage of Siena. We definitely would not have dined in such a stunning and extravagant setting, and we would not have tried such a wide assortment of vegan meals. Please enjoy this short video of our entire day! PIN TO PINTEREST! Click the button in the top left of the image to save it to your Pinterest gallery. Disclaimer: We were guests of Florencetown. Our thoughts and opinions, as always, are completely our own. We highly recommend that you book a tour with Florencetown when visiting Tuscany! Have you visited Tuscany before? What a cute city!! I am glad you guys had such a lovely trip to Italy. Everything looks perfect – the scenery, the history, and mostly the food :) I love how green the countryside looks, and great photos of the two of you. Too bad we couldn’t meet up and enjoy that veggie feast together, that food looks like heaven! We would have happily shared our veggie feast with you, Katie! There was so much food and it was just soooo good. I wish I could have somehow packed it all up and saved it for later! I could have eaten for weeks LOL. It was easy to be a vegan in Italy! We found lots of different options and generally speaking, people were very accommodating wherever we went. This tour was amazing for it, we were very pleased! Lovely towns! I would love to visit (I only been to Florence). I would choose a tour like the one you guys took (what a luck that you had the guide just to yourselves). I think it is a good way to relax and learn a lot about your destination. Plus, the good looks delicious. It was really lucky that we had the guide all to ourselves! But even still, only small groups would take this particular tour, so it would have been no problem to share with a few other people. We learned a lot in Tuscany and had a fair amount of time to explore. It was really the best and easiest way to visit a few places in one day! I’m a true Italophile and have seen lots of the country but somehow have yet to make it to San Gimignano. It’s always been on my list, and seeing your photos just moved it up a couple of notches. I am so jealous of the amazing vegan feast you had! Looks divine. Happy travels! Isn’t Tuscany amazing? I’ve passed by once while doing a 10-day Italy tour, so we visited only Florence, Pisa and Siena! I want to visit again, especially during late summer/early August when the fields will be golden! What a delightful country town. We visited Florence a few years ago and fell in love with the city. What little we saw of the area has made us want to go back and see more, and funnily enough, the cities you visited are at the top of our list! I do agree that taking a tour enhances a visit. You lucked out, being the only two on the tour. It sounds like an amazing day. Wow! It looks like you had an incredible trip, and some great tours! Italy really is beautiful, isn’t it. I visited Siena whilst on my honeymoon, and it was just beautiful – but now I wish we’d got a tour, as it looks like you really learned a lot. Fun fact, the main clock tower at my alma mater was modelled on the tower in Siena. My husband and I met at university so it was a nice place to see on our honeymoon! This looks like a great way to explore Tuscany! We would have loved to do something like this when we were in the area this past spring, but we didn’t have enough time. I think I’ll have to add it to the list for next time though–it looks like you got to see some great spots and the food sounds delicious! I love San Gimignano! It has been a goal to get back there someday! The whole region of Chianti and the Tuscan countryside is amazing.